We rank the worlds of Kingdom Hearts 3 from best to worst. We’ve spent a lot of time in Kingdom Hearts 3 soaking in everything the game has to offer. It feels surreal to think that the game is finally available after so many years of waiting, and every time we open it up, we get the same jolt of excitement. 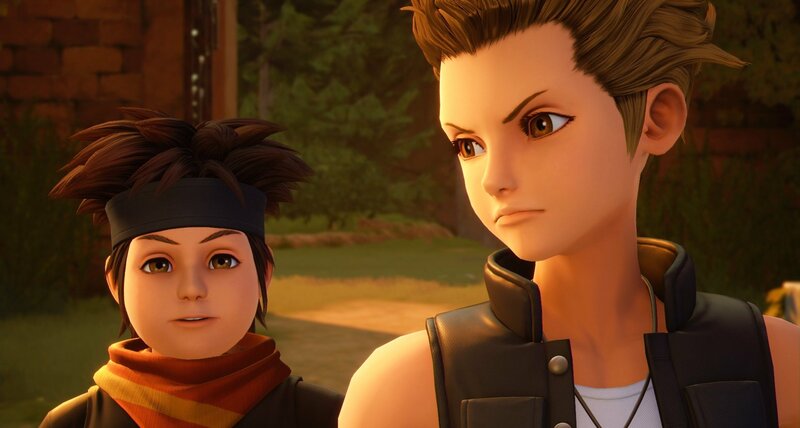 While we love all of the worlds in Kingdom Hearts 3, it can be fun to recap which ones stood out, and which ones left us wanting more. Plus, it gives us the opportunity to engage with other people in order to find out which worlds they’d rank from best to worst. Keep in mind that this list is based on personal opinion, and while we list several world critiques (especially towards the end), we’re in no way trying to bash the game. We adore every single part of Kingdom Hearts 3, even the worlds ranked at the bottom. So, without further ado, here are our Kingdom Hearts 3 world rankings from best to worst! Note: Some world descriptions have minor spoilers. We rank all of the Kingdom Hearts 3 worlds from best to worst! We’re not crying, you’re crying. We never thought we’d feel this emotional over Toy Story since the ending to Toy Story 3, but here we are literally immersed in the Toy Story world and it’s such an overwhelming feeling. Sora, Donald, and Goofy are transformed into toys and are shrunken down in order to fit in with Woody, Buzz, and even Rex. If having the opportunity to explore a Toy Story world isn’t enough to win your heart over, you also get “mini mech” type battles inside Galaxy Toys. There are also little Easter Eggs from the Pizza Planet truck in the parking lot of Galaxy Toys, to A113 on the back of a car across the street from Andy’s house. 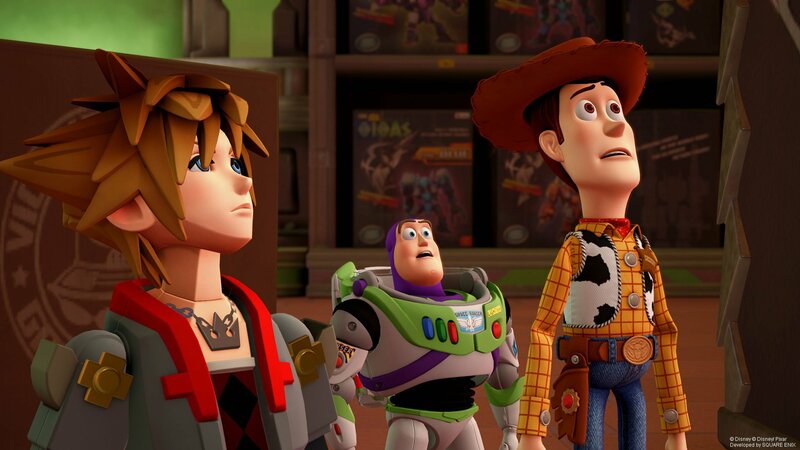 We’re overjoyed at the inclusion of Pixar films in Kingdom Hearts 3, and Toy Box serves as a shining example of how the series has evolved over the years and where it could go from here. Honestly, we’ll keep returning to the Toy Box world to get our fill of Toy Story until Toy Story 4 is finally out... then we’ll probably cry some more. Either way, Toy Box is the best, there’s no doubt in our minds! Our #2 pick is the Caribbean world in Kingdom Hearts 3. To be fair, we’d rank the Caribbean and Toy Box about even in terms of the “best” worlds that Kingdom Hearts 3 has to offer. During the intro to the Caribbean, we were absolutely blown away by the graphics and character design. 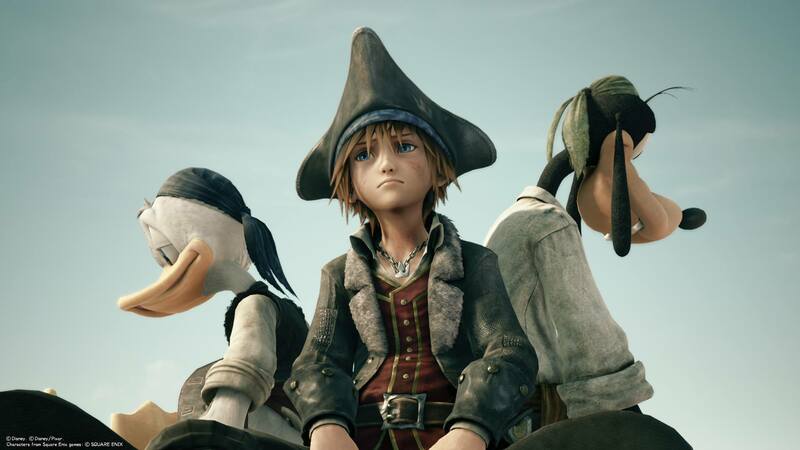 Sora and the gang look a lot more “real” while Jack Sparrow has a cartoony edge that honestly suits his style. We get a ton of Pirates of the Caribbean movie references thrown into the story and gameplay here from chasing down the Pearl to exploring Port Royal. The Caribbean lets you take control of your very own ship, the Leviathan, and explore however you see fit. You can hop from island to island in search of treasure, or you can dive into the crystal clear waters without having the fear of drowning crammed down your throat. The Caribbean is an absolute blast, and it’s one of the worlds we find ourselves returning to again and again. The pirate’s life is most definitely for us. Like Toy Box, the world of Monstropolis goes above and beyond in terms of making you feel like you’re exploring a Pixar world. The level design is quick and exciting, the dialogue is adorable, and we love all of the little nods to the original film. For example, you can use Mike as a bowling ball which harkens back to one of the jokes he tells at the end of Monsters, Inc.
It’s so satisfying to see Mike, Sulley, and Boo again in the way we remember them from the first film. We also felt that Sora, Donald, and Goofy’s transformation into “monsters” was extremely creative. Although, Goofy looks a bit too weird sometimes, especially when you see him wandering around in the background. This may be a bit of personal bias on our part, but Monsters, Inc. has always been one of our favorite Pixar films, so it’s impossible not to love Monstropolis. Our #4 pick is the Olympus world in Kingdom Hearts 3. The opening level of Kingdom Hearts 3 feels like classic Kingdom Hearts, which we loved. There’s nothing quite like returning to Kingdom Hearts like being able to hang with Hercules rather than fight him. 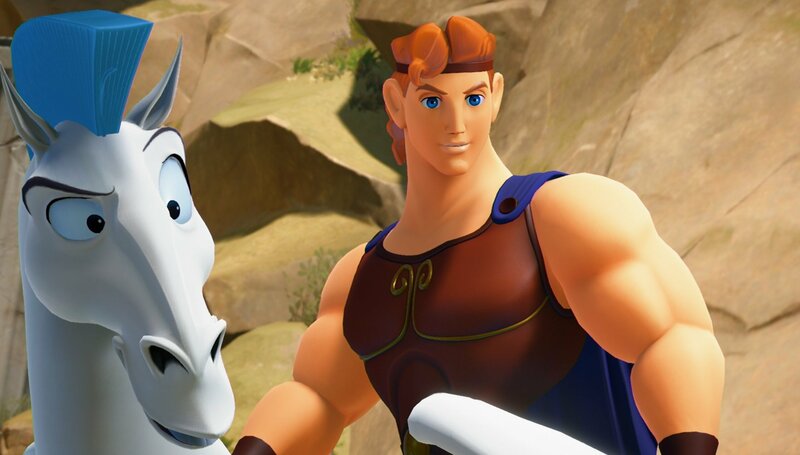 Hercules as a Disney film represents the Golden Era of Disney, one that feels distinctly different from the other Disney worlds in Kingdom Hearts 3 like Arendelle or Kingdom of Corona. 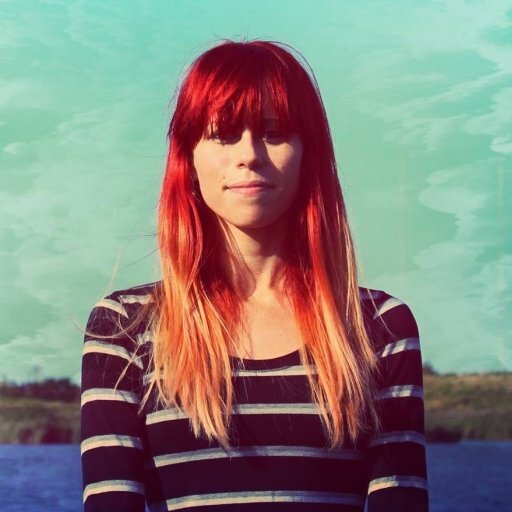 It’s got that nostalgic vibe to it where you can’t help but smile and dive in. Plus, the final battle at the end of the Olympus is one of the best in the game thanks to the grand scale and diversity of each Titan. 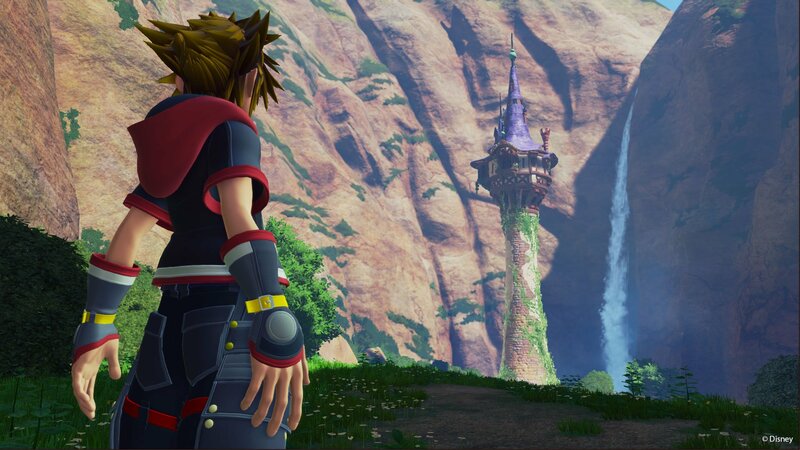 While we kind of wish there was a bit more to do in Olympus to warrant a return (besides collect Lucky Emblems and Golden Hercules figures), the Olympus world is a solid start to Kingdom Hearts 3 that pulls us in and refuses to let go. Finding the right ranking for San Fransokyo was difficult. The visual design is eye-catching, the combat is fun, and the world navigation offers something fresh. Unfortunately, there are parts of San Fransokyo that feel somewhat empty. This is emphasized when you’re walking around the streets of each district looking for Lucky Emblems. You can’t enter any of the buildings, there are only a few cars driving around the freeway ramps, and in general San Fransokyo feels abandoned. That’s not to say that scaling every single building, or using Airstep, to skirt around town isn’t a blast, because it is. However, San Fransokyo passed by a little too quickly and left us wanting more. Our #6 pick is the Kingdom of Corona world in Kingdom Hearts 3. Both San Fransokyo and Kingdom of Corona are middle tier worlds that aren’t necessarily good or bad, but simply enjoyable for what they are. There’s a lot of diversity to the scenery in Kingdom of Corona from lush forests to rocky hills and the Kingdom itself. Plus, the visual splendor of the lantern scene warmed our hearts all over again. Sora and the gang fit in surprisingly well with Flynn and Rapunzel, and we never felt bored by what Kingdom of Corona had to offer. That said, some areas felt a bit small, and the forest itself can be a little hard to navigate the first few tries. We also feel like Rapunzel wasn’t as memorable in Kingdom of Corona as she was in Tangled itself, but that’s a pretty minor complaint. Overall, Kingdom of Corona offers a solid Kingdom Hearts 3 experience. Our #7 pick is the Twilight Town world in Kingdom Hearts 3. Acting as the hub world to Kingdom Hearts 3 where you can purchase Gummi Ship upgrades, mail Postcards, cook with the Little Chef at the Bistro, visit Merlin and jump into 100 Acre Wood, and more. Overall, there’s certainly a plethora of things to do in Twilight Town. Unfortunately, the level design itself feels a bit plain. You have the option to explore town, the sewers underneath, and the forests around the Old Mansion. None of these areas feel like a living, breathing world like previous areas on our list. They’re too cramped, too similar, and too small (though not quite as small as 100 Acre Wood). The best parts of Twilight Town are the things we previously mentioned, along with the fact that you should have no trouble knowing where to go unlike our next to last pick, Arendelle. Don’t get us wrong, the Arendelle level is massive and boasts a wealth of fun story cutscenes and exciting combat opportunities. The real sticking point in why we’ve decided to rank Arendelle this low is its disorienting, snowy landscape. The vast majority of our time in Arendelle was spent struggling through mountain region after mountain region, and getting hopelessly lost. After a while, everything looks the same. Of course, our eyesight isn’t the best, so it was probably harder for us than it might’ve been for you. Despite this, you have to admit that the replay value for Arendelle is extremely low. Unless you enjoy putting that little snow gremlin Olaf back together over and over again. Finally, in last place, is the miniature world of 100 Acre Wood. The world itself is beautifully designed and has a nice storybook feel complete with the theme song to Winnie the Pooh playing on in the background. The reason why it’s ranked last though is because of how microscopic the world is, and how little there is to do. The main gameplay for 100 Acre Wood consists of playing the same match game with Rabbit three times in a row. By completing all three match games, you’ll earn an achievement and the Hunny Spout keyblade. There are also three Lucky Emblems to find in this world. For us, we would’ve ranked 100 Acre Wood higher had the three mini games offered different puzzles (not just match games) incorporating different Winnie the Pooh characters. With our list out of the way, if you had to rank the Kingdom Hearts 3 worlds from best to worst, what would your order be? Let us know down in the comments below! For more on Kingdom Hearts 3, be sure to check out some of our previous guides including where to find all Lucky Emblems in Kingdom Hearts 3, all Flantastic Seven locations in Kingdom Hearts 3, and where to mail Postcards in Kingdom Hearts 3.